An age-old question - what is the best position for sleeping? According to the National Sleep Foundation, the best sleeping position is on your back because it allows your spine to rest in a neutral position. However, there are often barriers that limit people from comfortably maintaining a neutral posture while on their back. Some are external, such as a non-supportive pillow or mattress, and some are internal, such as tight muscles or joints that affect a person’s resting posture. Because of this, people may feel more comfortable sleeping on their side or stomach. 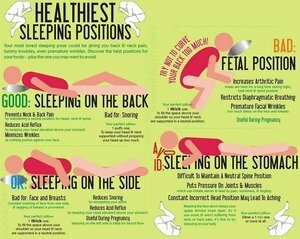 Of all sleeping positions, the National Sleep Foundation names stomach-sleeping as the worst, since it places the most stress on the lower back and neck. Keep your spine as aligned as possible. That pillow-top mattress seemed like a good idea at the time, but if you’re sinking so far into it that you’re lying like a banana for 8 hours a night, it might not be the right mattress for you. Choose a mattress that will support you in a neutral position with your body straight. Same goes for pillows - the thick “neck contoured” memory foam pillow may not be the best for you, depending on how you like to sleep. Sleep with a pillow between your knees (if you sleep on your side) or under your knees (if you sleep on your back). If you lie flat on your back, you will probably find that your lower back arches to the point where you can fit your hands/arms underneath. This arch places a lot of stress on the joints and muscles in your back, so you want to make it slightly flatter. An easy way to do this is by supporting your knees. Additionally, especially in women, your hips tend to be wider than your waist, and sometimes even wider than your shoulders! If you sleep on your side with your knees together, that places a lot of strain on the hip, especially the one that faces the ceiling. Sleeping with a pillow between your knees can help keep the hips in a better alignment throughout the night. Try to keep your arms below shoulder level. You probably tend to toss and turn and end up in all kinds of positions throughout the night, but keeping the arms below shoulder level can decrease compression on your brachial plexus, a nerve bundle that travels near your armpit and is responsible for the sensation and control of your muscles in your arms. If you experience numbness or tingling in your fingers that wake you up at night, try adjusting your position to one where your arms stay near your sides. If any of these methods work to decrease your pain while you sleep, it suggests that you may have some of those internal limitations that affect your resting posture. An evaluation by a physical therapist will help to determine those specific limitations and define ways to correct them! Our Doctors of Physical Therapy are ready to help you sleep pain-free - schedule your initial evaluation now by clicking here.